Get notified about upcoming shows. We never send mail about anything else, and we never send more than one update per week. Heron Arts is pleased to announce Okuda San Miguel's first exhibition in San Francisco, a new and refreshing collection of work featuring collaborations with major international artists. The exhibition Metamorphosis by Okuda, curated by the Spanish artist, will be on view at Heron Arts until May 11, 2019. 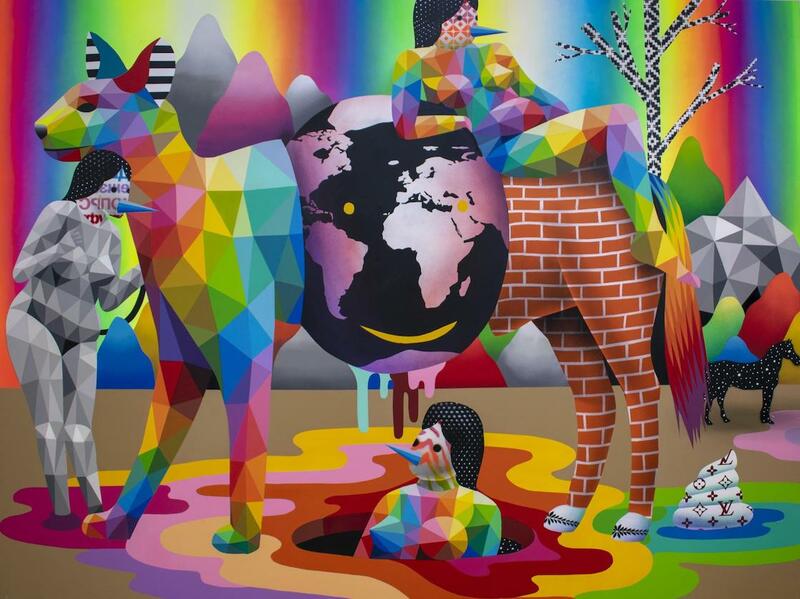 Visitors can enjoy a selection of Okuda's work, alongside pieces from a carefully chosen and surprising line-up of artists. 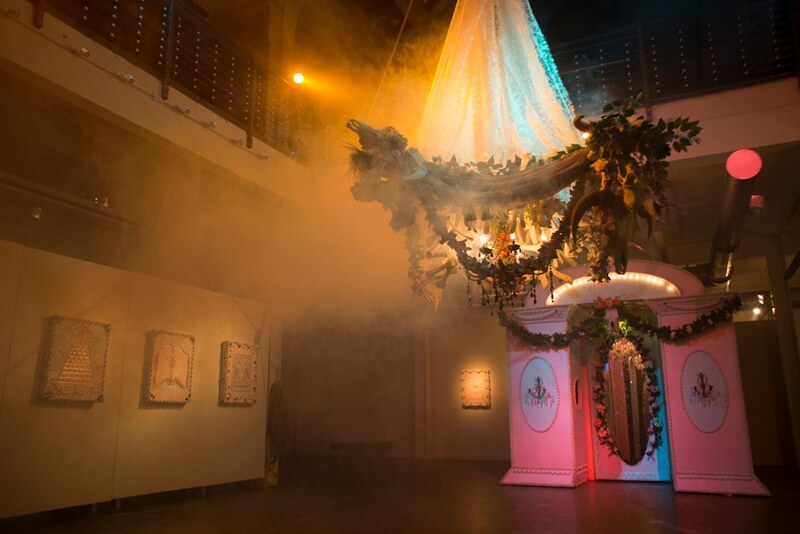 The opening of Metamorphosis will be on Friday, April 26th, 2019 at 7pm and is free and open to the public. 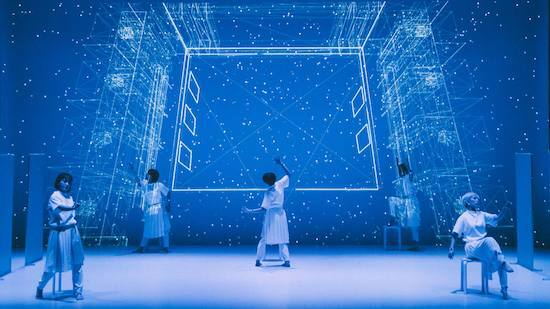 Following last year's sold out performances at Gray Area, 'discrete figures 2019' returns to San Francisco to present this expansive, dance technology performance by artist Daito Manabe’s Rhizomatiks Research and choreographer MIKIKO's ELEVENPLAY, in collaboration with artist Kyle McDonald. 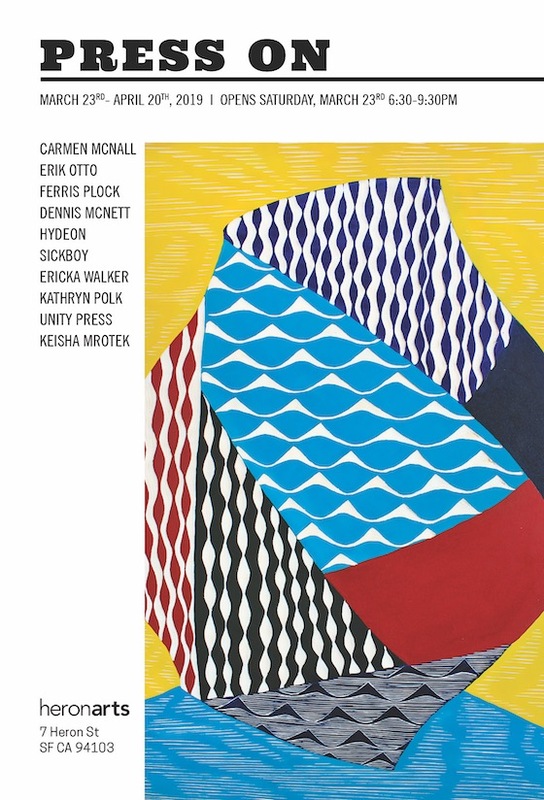 Heron Arts is pleased to present Press On, a group exhibition featuring Carmen McNall, Erik Otto, Ferris Plock, Dennis McNett, Ericka Walker, Kathryn Polk, Unity Press, Hydeon, Sickboy and Keisha Mrotek. Press On is curated by Tova Lobatz and opens on Saturday March 23rd, 2019 with an opening reception from 6:30-9:30 PM. The exhibition is free and open to the public. The show will be up until April 20th, open for viewing on Saturdays from 11am-4pm and on weekdays by appointment only. Heron Arts is pleased to present One Way Through, a group exhibition featuring Isabel Samaras, Nicomi Nix Turner, Liz Tran, Carmen McNall, Seonna Hong, Lyndi Sales, Nichole Washington, Lauren Napolitano, Faith XLVII, Blanda, Vexta, Ellen Rutt and Rachel Lena Esterline. The exhibition is curated by Tova Lobatz with a portion of the proceeds going to La Casa De Las Madres to raise money and awareness for domestic violence victims. One Way Through opens on Saturday November 17th, 2018 with an opening reception from 6:30-9:30 PM. The exhibition is free and open to the public. The show will be up until December 15th, open for viewing on Saturdays from 11am-4pm and on weekdays by appointment only. Heron Arts is pleased to announce "Tree no. 1," a new installation by Thomas Jackson. Expanding on ideas he has explored in his "Emergent Behavior" photographic series, Jackson's piece will juxtapose organic and manufactured materials to promote fresh perspectives on the complex balance between natural and manmade systems. 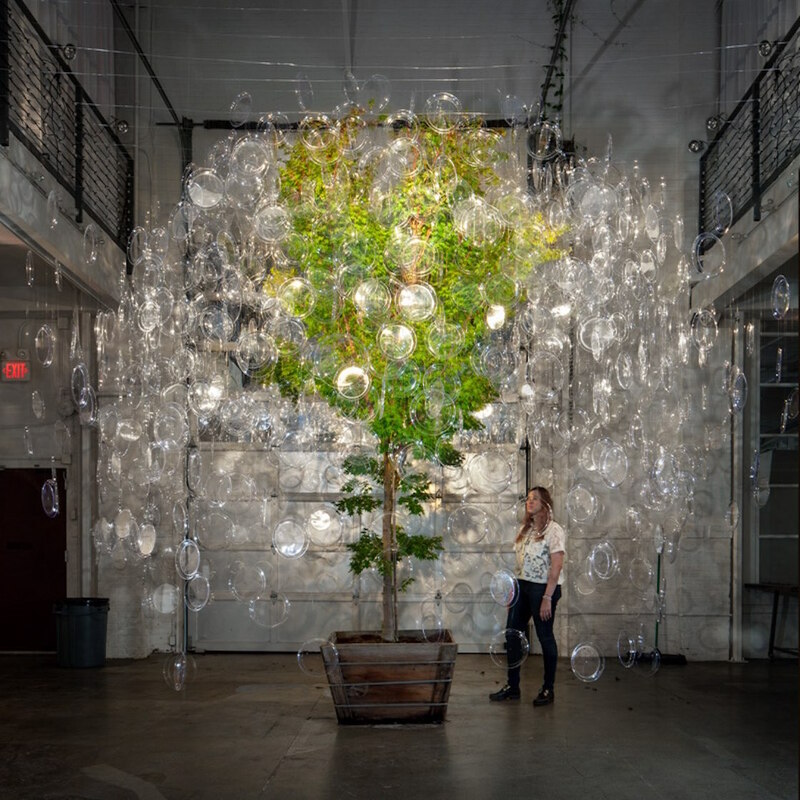 The piece will feature a 15-foot "Sango-Kaku” (Coral Bark Japanese Maple) surrounded by floating LED grow lights and plastic take out containers. While Jackson frequently works with organic materials in outdoor settings, this will be the first time he has incorporated living flora into an indoor sculpture. The work presses the viewer not only to contemplate our dysfunctional relationship with the natural landscape, but also to envision a sustainable future in which natural and man-made systems are integrated and intertwined, and more resilient as a result. The exhibition will also feature a number of prints from the “Emergent Behavior” series. 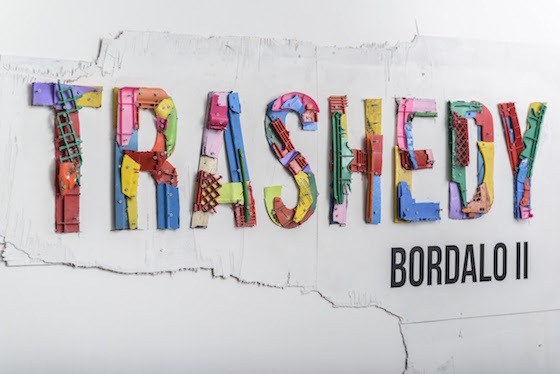 Heron Arts is pleased to present the ephemeral takeover by Portuguese artist, Bordalo II. This will be the artist’s first solo show in the United States and will feature a larger than life, all-encompassing installation including his signature trash animals, along with gallery pieces for sale. 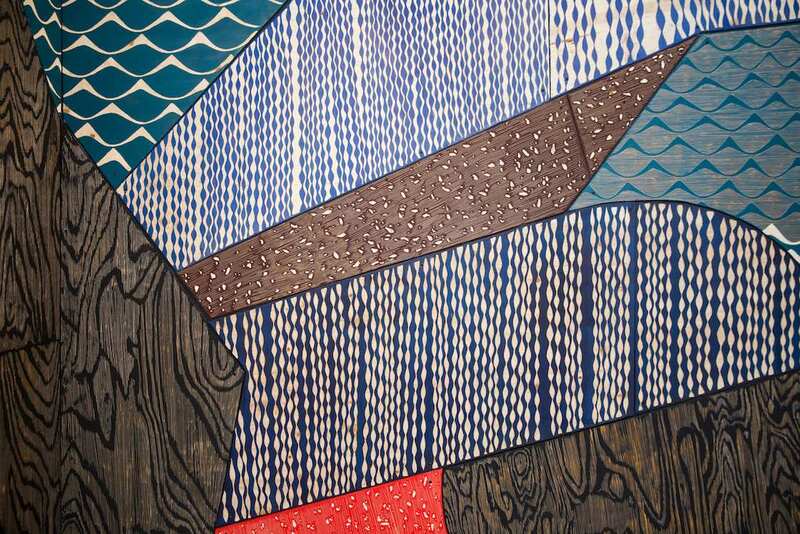 The work will continue to explore the themes of environmental awareness and consumerism. Bordalo II will be in attendance during the opening reception at Heron Arts on Saturday, February 24, 2018. The exhibition will be on display Saturdays from 11am-4pm or by appointment until March 24, 2018 and is free and open to the public. Heron Arts is excited to announce its upcoming solo exhibition of Bay to LA artist Scott Hove. Renowned for his local Oakland Cakeland installation, Hove recently relocated to Los Angeles where he has created immersive experiences for the LA Art Show and Banksy's Dismaland. His most recent 2016 exhibition at Break Bread in downtown Los Angeles featured a massive cake maze installation, receiving international press and over 30,000 attendees. His upcoming San Francisco exhibition will feature all new works ranging from decadent sculptural pieces to a site specific installation and new paintings. The opening reception is on Saturday, January 14th from 7-10pm and is free and open to the public. The exhibition will be open until February 7th, by appointment only.